His mother was an excellent cook, though she really isn’t up to it at all these days, so I’ll be moving into a well equipped kitchen. I’m keeping some tools and appliances I particularly like to use, and my favorite cookbooks, but many pots and pans and cookbooks need to go away. And somehow, after a day of posting stockpots and baking dishes for sale, and juggling arms full of cookbooks (I have mine, and his, and my mother’s, and the ones his ex left, and the ones he picked up at a thrift store, and the gifts my friends have given me, and…) well… after a day of all that I don’t really want to cook. So, the can of chili… that wasn’t in the cabinet. And sometimes that’s the problem, sometimes you need a quick meatless meal for someone, sometimes you need to work around a food sensitivity, sometimes you’re OK with cooking – as long as you can have dinner on the table quickly… I’d been playing around with ideas for a vegan chili made with the tofu burger crumbles, so I decided to go with the most basic version of that. Speaking of vague guidelines, this recipe really is just that. I’d finished my premade burger crumbles – if you have them, use them. Or for that matter, if you have preseasoned chili meat go ahead and use it. If you have and want ground meat it can replace the tofu – and honestly, beef or pork will give it a bit more flavor. (Turkey or chicken – not enough to make much difference, with the spices…) The recipe is gluten free, of course (and some canned chili is not – read labels!) 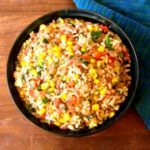 And I stirred in cooked rice, which I usually have – if you don’t, just serve it with taco chips or corn bread or whatever sounds good and is available. I had half a package of tofu – I’d used the rest a day or so earlier – so I took it out, sliced it, and wrapped it in a towel to dry while I started everything else. Do that… or get out your burger crumbles. Stir all that together, to distribute seasoning, and add half a cup of water. Simmer it for ten minutes so the flavor has a chance to permeate the tofu and beans. (OK, you can skip that part if you absolutely have to – but it does help.) Then add the cooked rice, stir in, and heat through. Taste it now to see if it needs more seasoning – but don’t make it too hot, remembering that the rice is already in the mix! 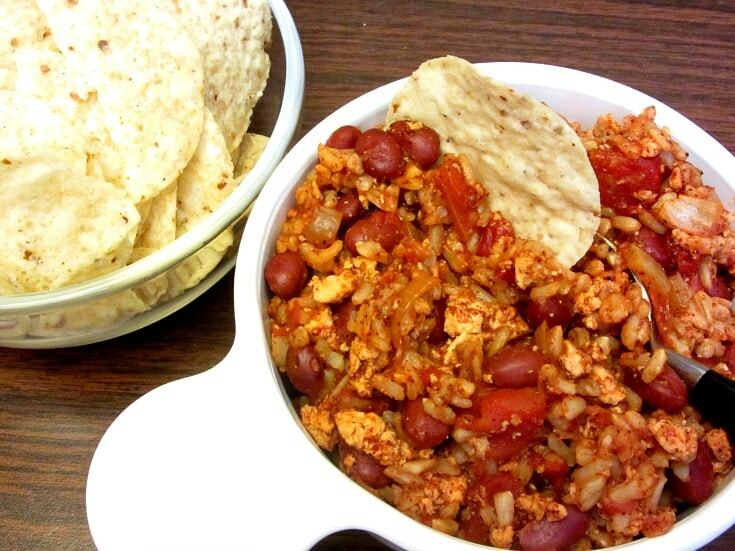 This is not the best chili you ever ate – or even the go-to recipe for ordinary weeknights. But it’s a perfectly reasonable dinner on a crazy night when you really do not have the time to cook, or a night when you are suddenly feeding someone who can’t eat the meal you planned. Or whatever emergency you face. Slice tofu and wrap in a towel to dry. Heat a pan and add oil. Mince onion, Add onion to pan, saute briefly. Add chili power and stir to distribute. 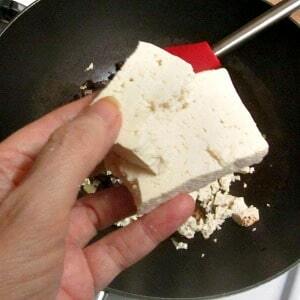 Crumble the tofu into the pan. Stir to coat with chili powder, and saute briefly until dry, and onion softens. 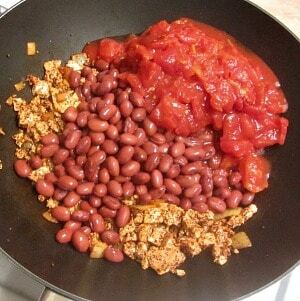 Add beans and tomatoes, stir well. Simmer for 10 minutes. Add rice, stir in, heat through. Taste and adjust seasoning, if needed. Thanks! Easy it is... because sometimes that's what we need most! LOL - most of my appliances are coming with me... (They downsized some of theirs in their last move.) But indeed, it is well equipped - and I have cooked in it before, so I have a reasonable idea of what to expect. I'm still waxing nostalgic over every saucepan... oh, well. 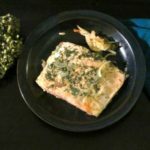 I hated cooking with tofu (though it was good in Asian restaurants... hmm...) until I learned how to prepare it from a Japanese cookbook. So many Westerners just really don't know how to use it... And that's the reason I stir it with the spices, here, to pick up as much flavor as possible. Thank you - you, too! With so many chili variations, I think you could eat chili every week and have a different one each time. This is the perfect comfort food, and would be great on a cold winter day. Oh, yes - I think I must have half a dozen versions on the blog already! It just fits so many slots, as it were - comforting, and flavorful, and satisfying, and it can be easy... Thanks - and it did turn cold finally! LOL. I love your title for this. Down and Dirty Vegan Chili. I have been known to throw together meals sometimes and Chili is so versatile. I do usually eat it vegetarian, thoough, so I don't eat any meat but seafood - and have yet to find a seafood chili. love me comforting + easy recipe such as this one. love this easy and delicious recipe! 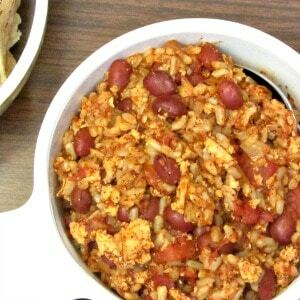 Ooh - love the idea of a vegan chili - this looks like it's great for weeknight meals. And I'm always game for more ways to use tofu! Yes - it's a nice option. Usually if I want it meatless I just use more beans - but that doesn't work for every situation, so I wanted another choice. I would love to move into my mother in laws kitchen! Man - she has everything! 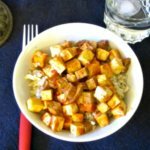 I've never thought about making chili with tofu! What a great idea! This recipe looks delish! LOL - I know what you mean, but... See, mine has everything - but so do I. I've been cooking for decades, and I actually worked in promotions for cookware for a while. So this involves a lot of - OK, her saucepans and my fry pans. Her blender and my food processor. Her plates (but I'm keeping a box - which I won't unpack in this house - of a few things I particularly like that I will want later.) And so on. It's complicated. I love quick and easy recipes like this. It's so nice to have a few recipes like this in your back pocket! I've never put tofu in chili before. I should totally try it! I have to have a few I don't have to think about! Do try the tofu - but do make sure you cook them as crumbles, first, for the texture. 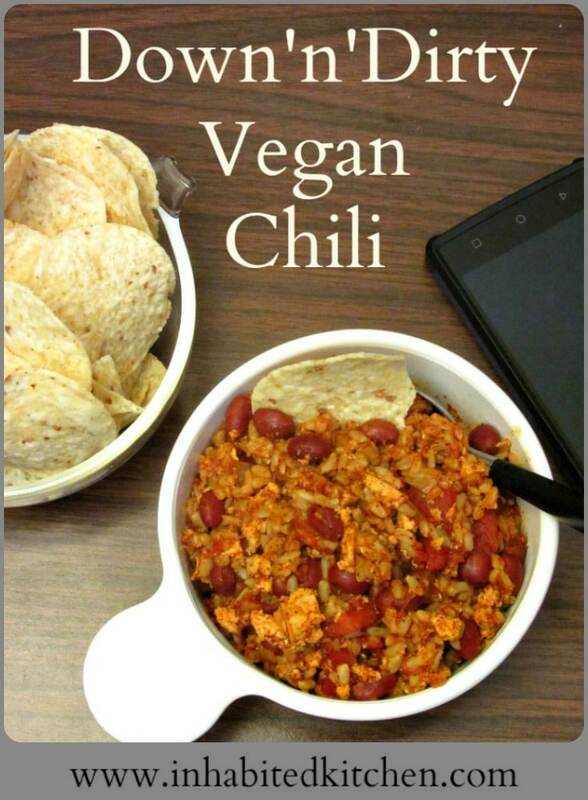 I've been eating a more vegetarian diet, and your vegan chili sounds wonderful! This looks great! I'm not a huge tofu fan, but I think I would like it if I found a very firm tofu. Right - firm tofu, and cook it as the crumbles, first. (And if you want - freeze it first, then thaw and squeeze out water, then cook as crumbles... ) The goal is to drive out moisture, so the tofu is firmer and picks up the seasoning mix. And you can skip it and just use more beans... But enjoy it, whatever you do! Looks a great chili and tofu is a new addition for me. All the best for your move and hope you settle soon! Thank you! I appreciate the good wishes! I don't usually use it, but it's a good option if, for some reason I don't want a lot of beans, but also don't want meat. I like playing with different ways of making things, because I never know which will turn out to be Just Right for one of you! I have a friend that is vegan and loves chili but has not made any herself. She will love this recipe, especially with the tofu. Oh, excellent! I hope she enjoys it, and thanks for sharing! LOL You have no idea how much you own until you try to spread it all over the living room to sort... And enjoy the chili! 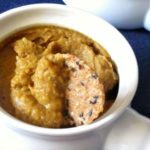 I'm excited to have found a new site for vegetarian/vegan recipes! This chili sounds great. Just so you know, many of my recipes are not vegetarian - but some are. I hope you enjoy the ones that suit you!